Miss Lucy was born and raised on the island of St John. She had ten brothers and sisters and was, among many other things, a kindergarten teacher. 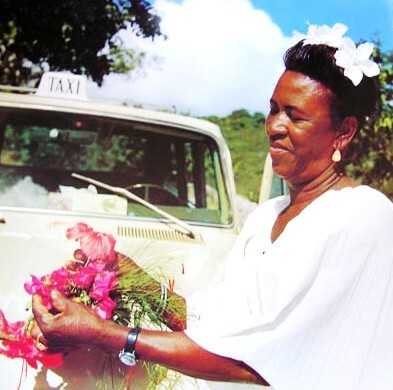 Later she became the first female taxi driver on the island and was famous for the wonderful tours she gave. Her passengers included the island locals, the tourists and many times the rich and famous... all of whom she always treated equally. 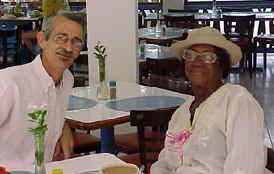 During her lifetime she had many, many friends of all races, culture and ethnic diversities. She was featured on several television shows and was also in various magazines including: National Geographic, Good Morning America and Travel magazine, to name just a few. Her knowledge of St John was extensive and she could tell you wonderful stories about everything from the hieroglyphics on Reef Bay trail, the revolt at Mary's Point, the importance of the ruins at Annaberg and even the legend about her own stone oven in the back yard where she baked and sold bread. 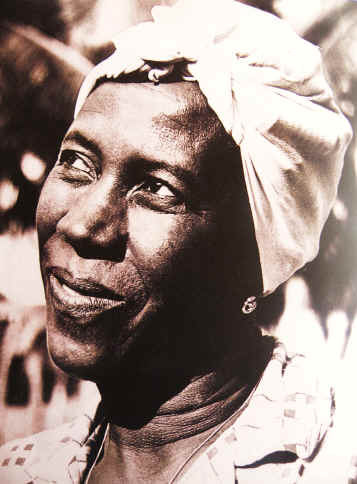 She kept her taxi adorned with local hibiscus, crotons, bougainvillea or oleanders that were placed in goat horns that she had fashioned into the hood ornament. For herself, she always wore a single flower... on the left side of her hair. Mama Lucy was a strong, independent woman. She'd often catch her own fish, collect sweet potatoes and mushrooms that were grown on her own property and then she'd call her friends and tourists alike, inviting them in to taste and eat what she'd prepared. She also became wildly known for her famous fish fry at the beach on Saturday nights. Later on, after she opened her restaurant, her Sunday brunches and Full Moon pig roasts became legendary. She was loved by the island locals and visitors alike, living a full and rich life until the age of 91. Throughout her years she 'adopted' so many 'children' along the way. She was an avid animal lover and was always family oriented...which included not only all of those 'adopted children' but also her children, her grandchildren, her great grandchildren and her great-great grandchildren! 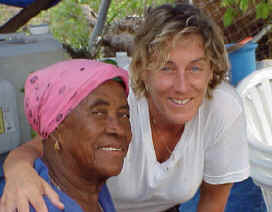 For those of us who live here, and for many island visitors who had the unique chance to spend a little time with her... Mama Lucy lives on, forever and always in our hearts.